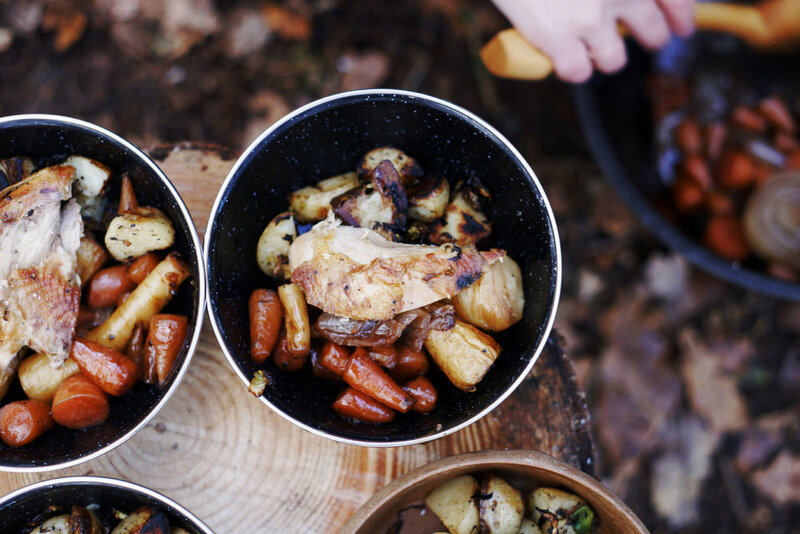 It's become an annual tradition for us in recent years to celebrate the festive season by heading into the woods and cooking up a Christmas feast over the campfire. Last year, we made pheasant burritos, but this year we opted for something more traditional; a delicious one pot roast Christmas lunch. We're calling it our 'Partridge in a Pear Tree Christmas Campfire Roast'. It's full of sweet and savoury flavours and makes for a rich, warming treat on a cold winter's day. Read on for all the details and recipe and maybe give it a go this holiday season. The key to successful outdoor cooking is preparation, so before heading out into the woods, we do as much food prep at home as possible. Cover the partridges with butter and season well. Stuff the cavity with a sprig of rosemary, thyme and a glove of garlic. Wrap them in parchment paper and keep cool. Chop all your vegetables so they are ready to go into the pot (if you are using baby parsnips and carrots, you will only need to top and tail them, leave the skins on). Peel the onions and slice into 2cm chunks. Chop the potatoes into quarters and par boil them. Leave to cool. Slice the sprouts thinly. Put all the vegetables in air tight containers and pack with your cooking kit. You will need a well established fire going before you start cooking so this should be your first job. This is because you will be using hot embers from the fire on the lid of the dutch oven and cooking it from below at the same time. Be sure to have some larger pieces of firewood to create a fairly slow burning fire with a consistent heat. Put a few knobs of butter into the Dutch Oven along with a good lug of oil. Hang over the fire with the lid on for five minutes to preheat. At the same time, heat up half a pint of water in your kettle on the fire. Chop your pears into thick chunks while you wait. Take the oven off the heat, carefully remove the lid and add the onions and pears to the base, these will act as a trivet for the partidges. Sprinkle the stock cube over the onions and pears then pour the water over so they are just covered. Hang the oven back over the heat with the lid on for another five minutes before taking it off again, adding the carrots and parsnips, followed by the partridges on top. Pour the wine over everything and season well. Put the lid on the oven, hang it on the tripod close to the fire (see our pictures for an idea of how close) then take some embers and pile them on the lid. This will ensure the food is cooked from above, and below. Every 10 minutes, carefully take the oven off the tripod, place it on a stump and take of the lid to check nothing is burning. If it is, raise the tripod a little before putting it back. 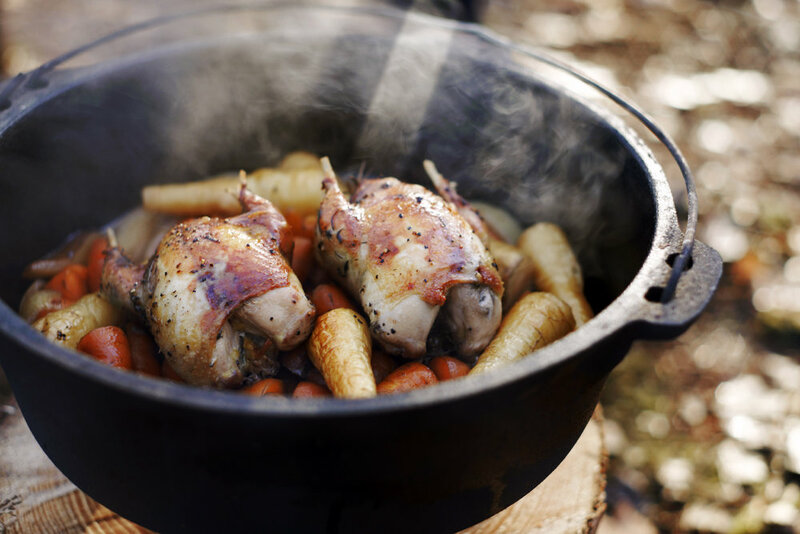 Cooking on a dutch oven is different every time, so regular checking is essential! Keep adding embers and checking until you are happy the birds are cooked. Take them out of the oven, wrap them in foil and keep them close to the fire to let them rest. Put the oven back on for 5 minutes or so and increase the fire so the wine, juices and water reduce to make a sticky, rich gravy then remove it from the tripod and set close to the fire to keep warm. Next, take the skillet and place it directly on the fire. Add butter and oil and let it melt. Throw in the potatoes, sprouts and chop the remaining garlic cloves. Fry until crispy and delicious looking. Unwrap the foil and carve the breast off each partridge. In serving bowls, spoon in plenty of roast vegetables, gravy, the sprouts and potatoes and top with a partridge breast and another spoonful of gravy. Eat! We'd like to also take this opportunity to wish you all a very Merry Christmas and a Happy New Year. We've once again had the pleasure of meeting lots of great people in 2017 through the work that we do here at Miscellaneous Adventures and are grateful for the support we have received from everyone who has bought a product, come along to a workshop or simply got in touch to encourage us in what we do. A heartfelt thank you from the three of us and here's to more to come in 2018.